West Virginia School of Osteopathic Medicine, Lewisburg, WV 2000-2004 D.O. 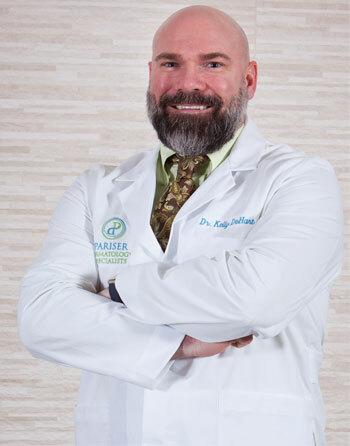 Dr. William Kelly DeHart is originally from Southwest Virginia and has an identical twin brother who is also a dermatologist at Pariser Dermatology Dr. Kelly DeHart enjoys treating all skin disorders and offers the convenience of early morning appointments. In his spare time, he enjoys going to the gym, playing several sports (racquetball, basketball and golf), reading, and spending time with friends. "It was such a pleasure to be treated with respect and have an assertive team to take action for me. Thank you!" "Dr Kelly DeHart was very professional, pleasant and easy to talk to. All of my concerns were answered and I left my visit completely satisfied." "Dr. Kelly DeHart and Melissa were very friendly, thorough and made sure I was comfortable throughout my procedure. The reception staff was also personable and friendly"
"I am very pleased with my experience at your clinic. My daughter sees Dr Kelly DeHart also and she is also very satisfied with her experiences." "I could not ask for more from dr. Kelly DeHart. He and his staff have been very caring and efficient. I wish all care facilities could be the same." "service is always outstanding with Dr. Kelly DeHart Also, the nurse(forgot name) who removed the lesion from my head was exceptional"
"Dr. Kelly DeHart has a reassuring, kind bedside manner! I came from a much different practice and I am so comfortable at the dermatologist now." "Kelly DeHart is the best!"